On October 22-26, we recognized four outstanding volunteers from our partners at Xylem Watermark by inviting them to join our founder, Philippe Cousteau, and EarthEcho Water Challenge Manager, Sean Russell, for a week of adventure and service exploring the water environments of south Florida. Xylem employees Jeff Boiling, John Lind, Nicole Simms, and Vickie Warrick were selected by Xylem to participate in this year’s program due to their volunteer work. Our time in Miami kicked off by teaming up with our partners at Marjorie Stoneman Douglas Biscayne Nature Center, where Xylem volunteers and Biscayne Nature Center educators worked with over 60 Miami-Dade County Public School Students to help introduce them to the local ecosystems in south Florida. Working with the Xylem volunteers, as well as our local EarthEcho Water Challenge Ambassadors Maria Torres, Domingo Cortinez, and Youth Leadership Council member Ugo Angeletti, students had the opportunity to learn about waterway conservation as they became citizen scientists and monitored local water quality. 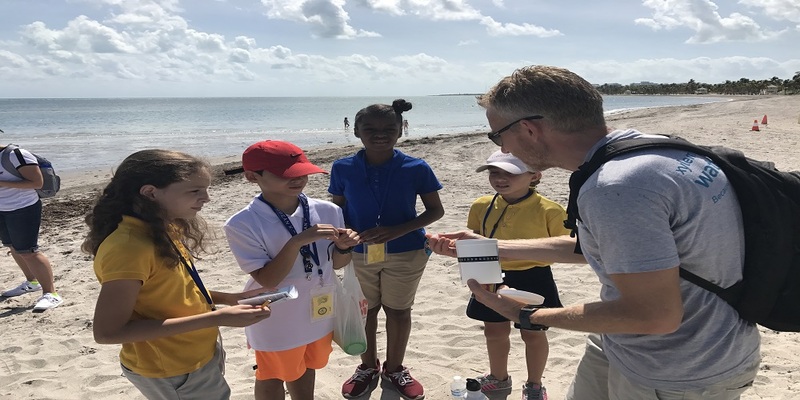 On Wednesday, our Xylem volunteers spent the day joining the renowned University of Miami Shark Research and Conservation program to learn about the important role sharks play in the local ecosystem, while tagging sharks off the coast of Key Biscayne, FL to collect critical data on these animals, contributing to our ability to protect these species. Assisted by the University of Miami team, including our Youth Leadership Council member Delaney Reynolds, our Xylem participants helped tag and collect data on four large nurse sharks during their time on the water. Our adventures in south Florida wrapped up with a culminating experience visiting Everglades National Park and exploring this unique region with the National Park Service team. A hike through the sawgrass prairie and a “slough slog” into the Cypress dome swamps of the Everglades helped highlight this unique region and the important role it plays in Florida’s water story. We are grateful for Xylem’s partnership and support of the EarthEcho Water Challenge and honored to have the opportunity to celebrate their outstanding employee volunteers through this experience!